BRYAN EATON/Staff Photo. Jason Attili, right, was volunteering at the Merrimac Food Pantry, and Nancy Bachelder, food pantry coordinator, left, mentioned a need for additional storage. 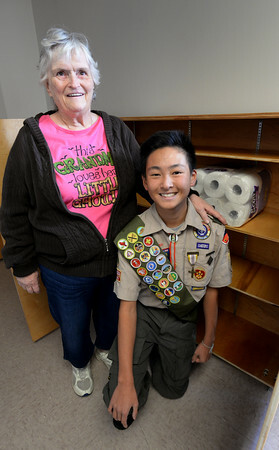 At the time, Jason was searching for a way to assist the community through his Eagle Scout project and so built the portagle storage bins, at rear.